This week I completed the second half of a pair of limed oak nightstands. I've been on this beach kick for a while now [which reminds me of this post I did on Modern Beach Style], and so I knew I'd need to figure out how to incorporate these into my home. Since I've already got two sizable nightstands in my master bedroom, and this pair couldn't really fit anywhere else, the guest room was going to have to evolve to make room for these babies. Well to be more accurate, it didn't actually go anywhere, it just got a temporary facelift with the help of a cotton tablecloth I had on hand. I'm surprisingly resourceful, folks! 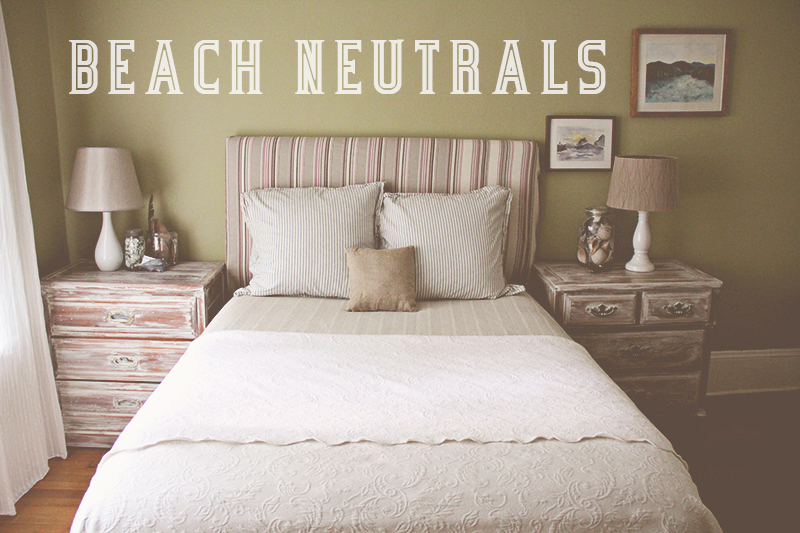 To mellow out the space for a change of pace, I went with different layers of 'beachy' neutrals; ticking stripes, linen, varying textures of whites and creams. I love how the original hardwood floors glow against all these pale colors. I know how to dress up a bed just fine, but it's the nightstands that really become the showstoppers in this space. The orange tinge of oak is masked by soft layers of white, using a technique I love [which you can learn how to do here!]. I love that these nightstands don't actually match [you'll notice some style differences, particularly with the drawer pulls], but by using the same paint technique, they become a cohesive pair. It also helps that they are nearly identical in size! A pair of large nightstands like these can be really hard to come by, which is why I'm so happy with the way they turned out! This set up is perfect for a smaller space where you may not have room for a dedicated dresser. It's even better for a guest room because if you have two staying over, each guest gets their own dresser to put away their personal belongings. [Space saving and practical!] I'm still just in awe of how dramatic the change is and how all it took was a tablecloth, some pieced together bedding in varying textures and neutrals, swapped out nightstands and decor, and voila! I now have a beach themed guest room for the summer months. Check out the nightstands on Craigslist, Etsy or in my shop!